I had a sweet potato sitting on my counter for a while, so I decided to turn that into my lunch yesterday. It was SO GOOD that I just have to share--it's not much of a "recipe", more of a "method". But either way, you've got to try it! Set the oven to 'broil' (mine has high and low, so I chose high). 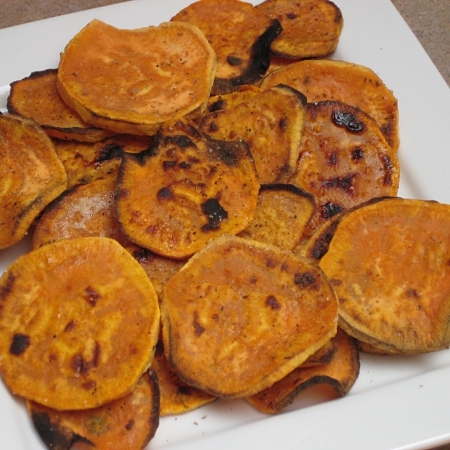 Peel the sweet potato and slice into thin slices (about 1/4 inch). Spray a baking sheet with the cooking spray, and then lay all the sweet potato pieces out on the sheet. Pile them all on a plate and devour them. Share them with someone, because this is probably at least two servings. I ate the whole batch for about 280 calories, which was totally worth it. These taste just like sweet potato fries, but they are so much easier to make--they cook more evenly, they don't stick to the baking sheet, and they take less time overall. A very well-spent 280 calories!